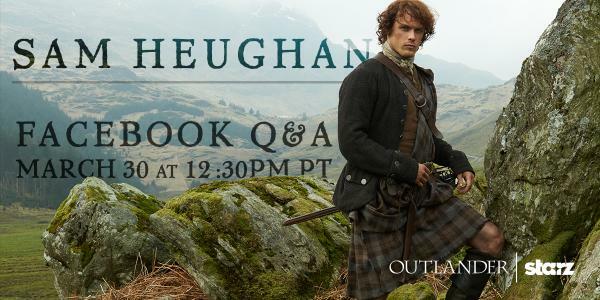 Outlander star Sam Heughan participated in a Facebook Q&A this afternoon, answering a variety of questions from fans about Jamie, season two, and even a few marriage proposals. Although the questions/answers do not go into great detail, there is a bit of discussion about Dragonfly in Amber/season two. These questions have been moved to their own section for those who wish to avoid spoilers. Check out the entire Q&A below and the original Facebook post here. Hi Sam, how did you mentally prepare for the Wentworth scenes? Admit it, you were the mystery Highlander from episode 1. Hi Sam! What has been the most challenging scene to film for the upcoming episodes? And thanks for being with us today! Although you are a perfect Jamie Fraser, which Outlander character would you most like to perform if you didn’t have the role of Jamie Fraser? And why? Thanks for sharing your talent. Hi Sam! While you and Caitrona were shooting hot scenes have you ever felt really excited? Have you ever tried to flirt with she? Sam, where in Scotland is your favourite place to visit? Sam, do you sometimes feel it is hard to live up to the role of Jamie and do you feel you are ready for the instant fame you are about to embark on? What a great character. Yes, I’m not Jamie. What was it about the part of Jamie Fraser that made you want to audition for the part? If you hadn’t gotten the part of Jamie, would you have tried for one of the other highlanders? Or even one of the red-coats? Why did they change Jamie’s Fraser Tartan? I was skeptical that anyone could pull off Jamie onscreen, but you have managed it. Jamie changes his Mackenzie tartan (whilst in hiding) to his Fraser family tartan. Can’t wait to see you at the NYC premier. Thanks for bringing our beloved Jamie to life. Great job to the entire cast!!? Hi Sam! Have you done any screen tests with possible Brees or Rogers? Not yet but do know a few actors who are auditioning! Exciting times! Sam, first of all I you and your portrayal of Jamie. I am looking forward to Season 2. Do you speak French or are you having to learn it for Dragonfly in Amber? Es to prest? Have you read book 2 (Dragonfly in Amber) yet? did you, or any of the cast members, have any costume/wardrobe challenges for the upcoming series? So Outlander will make it to the storyline in America? If that is correct, will filming be in U.S.? I think that’s what we ALL want to ask him! hahaha! What is the one question you inwardly cringe at when asked over and over? Hello from Indiana! Where do YOU call home Mr. Heughan? What’s your middle name? You told that’s bad, but you haven’t told what is it! May I ask? Sam, are you planning any more charitable events involving endurance activities!! I am doing my first Ironman and would love to raise money to donate in your charities name! Wondering about the scar on right cheekbone . . . sword fighting? Hello Sam, Who was your favorite actor while you were growing up. Hi Sam…… Since you’ve already been Batman and worked with Roger Moore, would you ever like to play James Bond??? You have been traveling so much. Do you like to fly? Have you thought about borrowing the #BatPlane? Can I scratch your scruff? Hey Sam – have you ‘bagged’ any 14ers during your time off? was a trauma to cut across that beautiful beard? Sam, I am old enough to be your mum but my heart speeds up when I watch you. Great job filling Jamie’s big shoes! Hi Sam. What is your favorite Whisky? Tasted 4 this morning before 10.30am… ALL of them! What is your favorite thing about Los Angeles? Or do you cook? And if so what is your speciality dish? This entry was posted in Sam Heughan and tagged Facebook Q&A, Jamie Fraser, Sam Heughan by Stephanie Bertone. Bookmark the permalink.